Heat in Australia is generating wildfires, dust storms, power outages. Feed is getting harder to find, poorer quality and more expensive. Some dairy producers are having great difficulty getting enough water to cows. Australian seasonal milk production in the first 5 months of the dairy season 2018-19 is -4.9% from July-November 2017. In November there was a decrease of -7.8%, in particular in Victoria and New South Wales, the two most productive states. New Zealand is approaching a four to six weeks period when the final outcome of the milk production season will be essentially determined. The very good seasonal increases so far are not expected to decline much. June-December 2018 New Zealand milk production was +4.4% from June-December 2017. Full year 2018 MilkSolids are +2.1% from full year 2017 and higher from the previous five years. Oceania Butter prices firmed, but they remain lower than European prices. Price strength is expected to continue in the coming months. Spot market availability is limited. Prices for SMP increased slightly and this trend is expected to continue in the coming months. SMP demand remains strong and production has begun to slow for the season. WMP prices in Oceania strengthened. Buyers are eager to lock in future supplies. 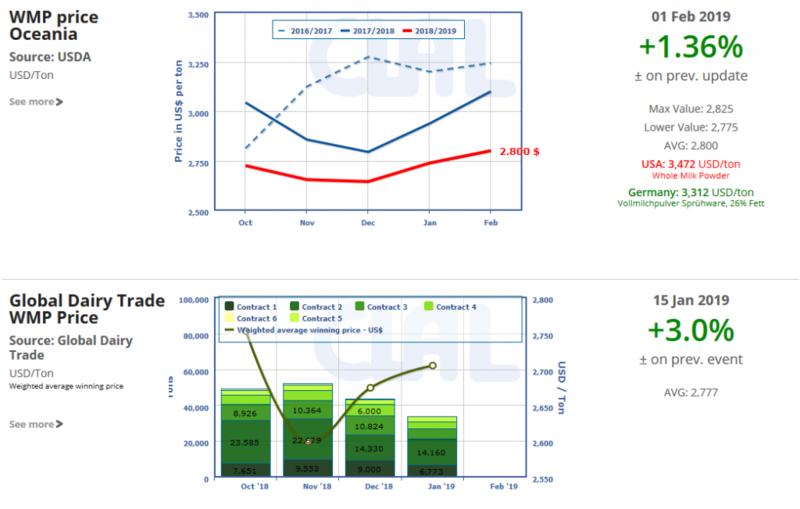 Oceania Cheddar prices slightly firmed. Production is taking care of existing commitments. Stocks need to increase before the low months of milk production. The CLAL.it team is composed of young people who with the help of Computer Science study the dairy market and develop tools to provide the Operators of the dairy sector with a comprehensive real-time view of the national and international market trends.